Its interesting to see how Muffin's sense of humor is developing. What she thinks is a joke is weird, she'll say something like " A dog and… a rock". Then she'll laugh. I guess she thinks putting together things that don't seem to go together looks funny to her. We just play along and laugh heartily and she loves it. Lately she's taken to just piling on the words, and will keep going on and on. She's rediscovered Mr & Mrs. Potato Head. First she had to take down Mrs. 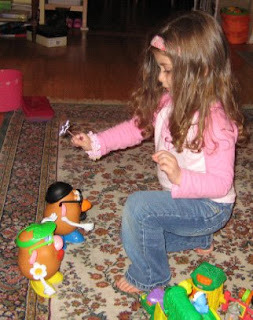 Potato Head's phone number in her phone book, then she had to get them married using her magic wand. I hear there's a store in Magic Kingdom (Disney) where they sell more parts for Mr Potato Head, we may have to hunt this place down!